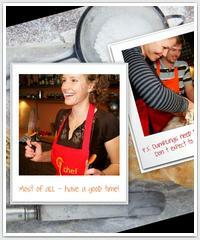 Cooking School Chefparade is for everyone, who likes to try new things, explores new tastes and most of all - have fun! Class for tourists will introduce you to the typical Czech cuisine with you in the main role! Hands-on course gives you the opportunity to cook side-by-side with our Chefs. Learn about the basic ingredients and spices along with best cooking practices so you’ll be able to treat your family and friends to a fantastic Czech dinner in your home country.